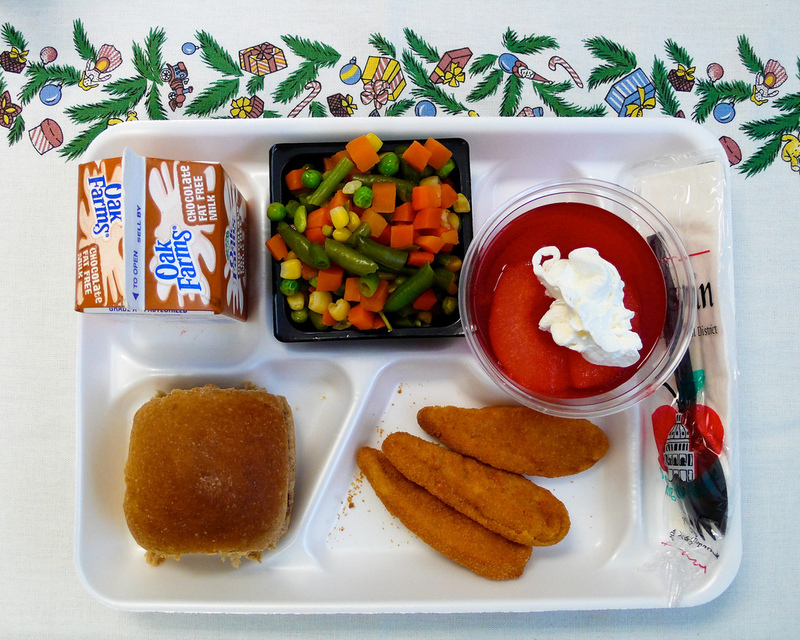 Mark Bittman’s blog recently caught my eye with a piece about how school lunches in the United States are worse than in many countries, including a number far poorer than we are. In Brazil, he points out, 30% of food for school lunches has to be bought from local farmers. Here, we get excited when we get an unfunded state mandate to include local produce in school meals. And it’s not news to anyone that school cafeterias have very little money to work with, and often nowhere to cook actual food. Most talk about improving school nutrition focuses on minor changes, like increasing the amount spent per child per meal by a few cents. I wish we could think bigger. The nutrition of children, mothers, and women who plan to become mothers soon is arguably the single most important aspect of health in which we could invest. Should we really be arguing about cents? Shouldn’t we be thinking in terms of dollars, nutrients, and everything kids deserve? But this isn’t a debate we’re going to win any time soon, and there’s a case to be made for starting small, picking one aspect of school diet and advocating for it to change. Today’s target: low-fat and skim milk. The USDA advocates for replacing whole milk with these alternatives. They shouldn’t. I’ve written in detail about milk before (Do you know your milk?). Low-fat milk has been associated with adult health risks, as in this study which suggested low-fat dairy is associated with anovulatory infertility (as compared with full-fat dairy). But the issue of milk in school diet deserves specific attention. Readers of this blog are probably already aware that saturated fat is not the culprit of obesity or other markers of metabolic syndrome, but that cheap vegetable oil and sugars and plentiful carbohydrates are more to blame (post on cooking fats and oils is here, for more information). What do studies on whole milk versus low-fat/skim milk in childhood say? Is it true whole milk isn’t associated with increased weight gain, or that it’s somehow protective? Could reducing milk fat actually be detrimental? To find out, I dug up some research on milk consumption in childhood and adolescence, and the relationship to obesity, weight gain, and metabolic syndrome. There was a study or two that seemed, at a glance, to favor reducing milk fat. But it became quickly apparent that these were not studies measuring impact on health, but studies measuring behavior itself. It’s important to be aware that, in research about obesity interventions in school meals, studies that claim to show positive results for reducing saturated fat often do something sneaky: Instead of showing positive results for markers of health (lowered markers of metabolic syndrome, excessive weight gain, etc), they show positive results for — wait for it — reducing saturated fat intake. Yes, interventions to reduce saturated fat intake in school meals can be successful at reducing saturated fat intake in school meals. Here’s an example about the NYC schools and milk consumption. The authors concluded that replacing whole milk in schools with low-fat milk reduces milk fat consumption in schools. We might as well have a study proving that limiting the number of bananas served in school greatly reduces the number of yellow fruits on the school menu. Here’s an example about an obesity intervention program among Native American school children. In this study, the researchers spent three years (and likely a great deal of money — an entire issue of the American Journal of Clinical Nutrition was devoted to their prospective analysis) reducing saturated fat in school diet, on the theory that it would prevent obesity, and failed to produce any difference between the intervention and control groups. Their report, with chutzpah, insisted their work had been a success, because they’d reduced saturated fat in the school diet. Never mind that this reduction had no impact on any of their own markers of student health. I found no study suggesting measurable health benefits for school children drinking low-fat or skim milk instead of whole milk. However, there are actually some decent studies on milk consumption in childhood and adolescence, and the association between milk fat consumption and obesity. I found four. Each study found no association between increased whole milk consumption and increased obesity or other indicators of metabolic ill health. Some studies found detrimental associations with reduced-fat milk. Others found that whole milk intake was inversely associated with obesity or metabolic health risks. 1 — Berkey CS, et al. Milk, dairy fat, dietary calcium, and weight gain: a longitudinal study of adolescents. Arch Pediatr Adolesc Med. 2005 Jun;159(6):543-50. This study examined dairy consumption and weight gain in a large cohort of adolescents and preadolescents ages 9-14. Overall dairy consumption was associated with weight gain but, on closer analysis, this was attributable to consumption of non-fat and low-fat milk, but not whole milk. Dietary fat was not associated with weight gain. Dietary calcium was. Low-fat and non-fat milk were. This finding was contrary to the researchers’ hypothesis but, like good scientists, they reported the results. 2 — Barba G, et al. Inverse association between body mass and frequency of milk consumption in children. Br J Nutr. 2005 Jan;93(1):15-9. Whole milk consumption was inversely associated with BMI (e.g. whole milk drinkers had lower BMI). When skim milk was added to the picture, the association no longer held true. The researchers controlled for a number of relevant factors, including other aspects of diet, birth weight, parental education, and parental overweight. 3 — Pereira MA, et al. Dairy consumption, obesity, and the insulin resistance syndrome in young adults: the CARDIA Study. JAMA. 2002 Apr 24;287(16):2081-9. Dairy consumption was inversely associated with insulin resistance. Dairy fat was not predictive of weight gain. The authors note an association between high dairy intake and other frequent foods (fruits, vegetables, saturated fat…), and that the study’s observational nature limits it from establishing causality. This potential for confounding is a challenge of applying epidemiological methods to nutrition studies, but not one that can’t be overcome. 4 — Huh SY, et al. Prospective association between milk intake and adiposity in preschool-aged children. J Am Diet Assoc. 2010 Apr;110(4):563-70. Assessed milk intake (whole, low-fat or skim) at age 2, compared with adiposity at age 3. Whole milk consumption at age 2 is associated with slightly reduced risk of adiposity at age 3, but the association is null when results were restricted to those with a normal BMI. Milk intake itself was not found to prevent adiposity, but dairy fat was also not found to contribute to it. Something these studies don’t mention is that taking away dairy fat means taking away a source of protective fat-soluble vitamins for kids who may already be getting inadequate nutrition. Industrially produced milk may not be the best food there is, and milk itself may not be suitable for some kids (e.g. lactose intolerance, etc) but given the dismal state of school nutrition, we can’t afford to yield the more healthful version of industrial milk to an even less nutritious (and potentially detrimental) counterpart, especially when the argument for doing so runs contrary to available data. If we want the USDA to make this change, we can educate about it, talk to our local school districts, or contact the USDA directly (try Janey.Thornton@usda.gov). Change probably has to come from the USDA, since school districts receive nutrition guidelines from them. This change may never happen. Certainly, there are political limitations. It still seems counterintuitive to some people that dietary saturated fat is not actually a contributor to obesity. And so making such a change, on such a high level as the USDA, sounds politically risky. Yet, years of recommending reductions in saturated fat have had no positive effect. Efforts should instead focus on the things that work, like the reduction of sugars/sweetened beverages, packaged foods, simple carbohydrates, and vegetable oil. Besides, by the USDA’s own data (http://www.ers.usda.gov/data/foodconsumption/FoodAvailspreadsheets.htm) our nation consumes less saturated fat, full-fat dairy, and red meat (and more fruits and vegetables) than we did thirty-five years ago. The real changes to our diet in this time, per USDA data, have been an increase in vegetable oils and corn sweeteners, both of which spiked in the mid 1980s, at the same time the obesity epidemic began growing significantly. It’s time to focus on these real culprits, and not on animal fat. Allowing full-fat milk in school meals is a simple and research-based place to start. Thanks to bookgrl for the Creative Commons photo. This is music to my ears. Skimming milk and taking fat out should be leading to health problems because it is not how milk comes in nature. Like with eggs, if you serve egg whites you put people in danger of getting egg white injury. Thank you for your blog! I found it as I started digging for information for where on earth this new 1% policy came from! My youngest just started his 2’s program at a local montessori school. We used to have a milk program where the parents would bring in organic whole milk for the children to drink with lunch during the course of the school year(via the teacher serving it for our children). Now, we have decided to abolish the milk program because of this crazy 1% act-beause the school can’t ‘serve’ anything other than 1%! Us parents will now bring in our own whole milk everyday in a thermos! My 2 year old doesn’t eat much and I’ll tell you that he’d be skin and bones if he didn’t get his whole milk. And what about his brain development! He needs that good natural fat!Furthermore, I have also read how much this low fat way of living has contributed to metobolic issues (I was just recently diagnosed with hyperthyroidism)…and more chemicals have been added as a fat repalcement in some foods. Great…so chemicals are now better than fat!? I don’t think so! Chemicals are making us fat (among the other things you’ve mentioned). Since this law was passed on a federal level and encompasses other issues…is there a way to segregate this milk issue and get it changed. I strongly disagree with the government mandating what my child should and should not be eating. I’m the parent, it is my job! Thanks again!